Coffee pods from single-serving coffee makers belong in the tan refuse container. They are garbage. Do not place them in the recycling. Do not place the single-use creamer cups in the recycling, either. These small cups clog screens at the recycling center used for sorting glass from the other recyclables. The sorting machinery has to be routinely stopped, and these cups need to be plucked from the screens. Want to see what the recycling sorting system looks like? I LIKE MY SINGLe-serving COFFEE MAKER. But i don't like that the pods are garbage. what do i do? Any single-use plastic item should be carefully evaluated on how much you really need them, and how much convenience they truly provide - and if that convenience is worth the cost of creating garbage that can't be recycled in our current sorting systems. 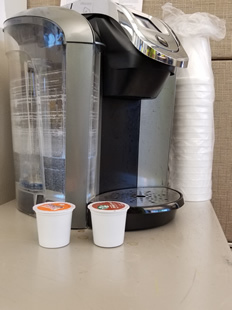 If you want to stick with your single-serving coffee makers and want to avoid the extra garbage, choose re-usable/re-fillable pods. You should also avoid single-use cups and go with mugs.